This tutorial will show you step by step how to rip (copy) music from an audio CD to your PC using Windows Media Player in Windows 10. Windows Media Player will copy songs from your CD to your computer's hard drive in MP3 audio format, but you can also choose another audio format, like WMA, WAV or FLAC. 1. Insert the audio CD you want to rip into the CD drive of your PC. Click on the start menu button, scroll down to the letter W, click on Windows Accessories and then click on Windows Media Player. Enter WMP in the search bar (or Cortana) and then click on Windows Media Player when it appears. Press the [Windows] + [R] keys on your keyboard, enter wmplayer.exe and hit Enter. 3. In the left sidebar, you click on your CD (e.g., AlbumName (E:)). 4. 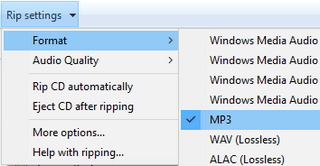 Click on Rip Settings, go to Format and choose MP3 or another audio format, like WMA, WAV or FLAC. 6. You can uncheck (deselect) the songs you don't want to rip to your computer. 7. Click on Rip CD located next to Rip Settings at the top. Windows Media Player will now rip (copy) music from your CD to your computer's hard drive and into another audio format, like MP3, WMA, WAV or FLAC. Windows Media Player will save your songs at the following location on your computer: C:\Users\User\Music (My Music).